You might well be asking yourself what is the Red Cardinal crackpot on about now? Well, this is another one of those ‘one thing leads to another‘ posts. Last week I blogged my views on the forthcoming Search Marketing World expo. In particular I felt that disclosure around the site clinic sponsorship was very weak. Some people agreed, some people didn’t see the problem. 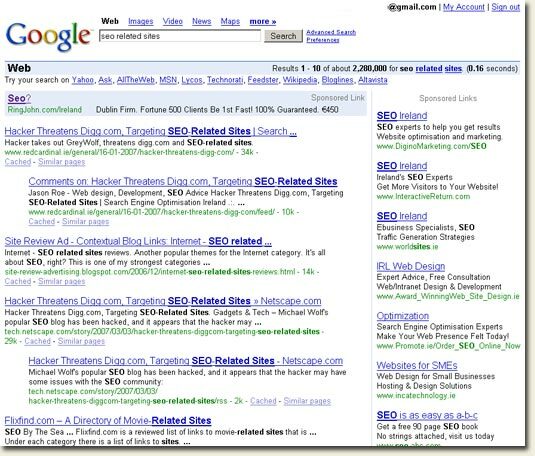 Being listed on top in the search engine results is practically the priority of online marketing. In order to attain this primary objective, several techniques and ways have been explored and experimented with. Some techniques are successful but some are not. In fact, the impact of each technique varies relatively to different web marketers. Spidering may be very efficient to some but not to all. If your problem is how to maintain traffic in your web site, worry no more because a search engine cloaker is around. Cloaking outsmarts the search engines to increase your listings, and increase your web site traffic by a hit generating tool. How is this possible? Simple. The cloaker automatically generates thousands of pages just for the spiders. These are built from keyword list you manage through a web console. While search engines take their listing through sending automated spiders to go to each site, follow respective links, and do the indexing of keywords, the cloaker, once installed in your server, optimises your site by simply updating itself to ensure that you are all the time is with the best solution to outscore search engine. It does not use spam indexing techniques like ALT tags, hiding keywords, and others. It will just build keyword-rich pages that will definitely top in the search listing. In other words, a cloaker beats the traditional search engine spider. Cloaking software is commonly used in commercial areas of highly competitive fields such as travel, softwar,e, and real estate. Although it underwent some controversies in the process, cloaking proved to be very effective as used by many web sites ranging in size from small companies to many big time enterprises. There was a time when Google did not agree completely to the idea of cloaking thinking that it is not always a good thing, did not recommend it to people because they believe most people use it in an abusive manner yet realised and understand that there are a large number of companies, many of them their advertisers, that use the technology and it is not causing any harm in many cases. As long as cloaking is use responsibly for the benefit of the web users, then there is never a problem in its employment. Let me just note that Google has never endorsed the use of cloaking in the sense mentioned above. While there are situations when cloaking can be justified (e.g. conditional redirects), the above mentioned techniques do not fit those situations in any way, shape or form. Google may temporarily or permanently remove sites from its index and search results if it believes it is obligated to do so by law, if the sites do not meet Google’s quality guidelines, or for other reasons, such as if the sites detract from users’ ability to locate relevant information. We cannot comment on the individual reasons a page may be removed. However, certain actions such as cloaking, writing text in such a way that it can be seen by search engines but not by users, or setting up pages/links with the sole purpose of fooling search engines may result in removal from our index. Please read our Webmaster Guidelines for more information. I know that it is very bad form to dish a competitor. I also know that this isn’t going to make me any friends, and will more likely than not reflect badly on my own reputation. But this isn’t about dishing competitors. This is about disclosure. I’ll let readers put two and two together. Hard to believe that an “seo company” are promoting tactics like that. Fair play for highlighting it. BMW Germany got slapped by Google for doing just this if I recall correctly. I’m stunned that any Irish SEO is openly endorsing cloaking on its site. You only need to have a tiny bit of knowledge about search engines to know that’s a very bad idea! And making guarantees of SEO success sounds a bit dodgy too… I think RingJohn are actually speaking at Search Marketing World so I wonder will they be keeping it white hat on the day at least? I think I’m going to have to move from search engine watch to search engine land.